The Casio Celviano AP-270 Digital Piano contains an award-winning audio engine, sublime tri-sensor piano keyboard technology, superb effects and more all wrapped in an elegant cabinet that would look wonderful in your home or venue. Thoughtfully designed to complement any décor the beautiful AP-270 looks every bit as good as it sounds and is suited to players of all skill levels. The AP-270 contains two beautiful new stereo grand piano tones that have been painstakingly sampled and brought to life with damper resonance, simulating the entire body of the instrument, not just the strings. In addition to articulate pianos, the Casio AP-270 features a variety of 19 instruments, with the ability to layer and split for dynamic performances. With a generous 192 notes of polyphony, even the most detailed of performances will be voiced without compromise. To complement the sound engine the AP-270 boasts acclaimed Tri-Sensor II Scaled Hammer Action piano keys topped off with a simulated ebony and ivory material for a smooth touch. Progressive hammer action means that just like a grand, the keyboard will 'play' heavier the further down the tonal range you go and lighter toward the top. Adjustable touch sensitivity allows customisation to suit any playing style, and adjustable hammer response accurately reproduces the delay between when the key is pressed, and a note is sounded. For the times when silent practice may be needed, the AP-270 can shut-off the internal speaker system when headphones are plugged in. Because the AP-270 also supports up to 2 headsets at any time, student and teacher can work together without disturbing others. 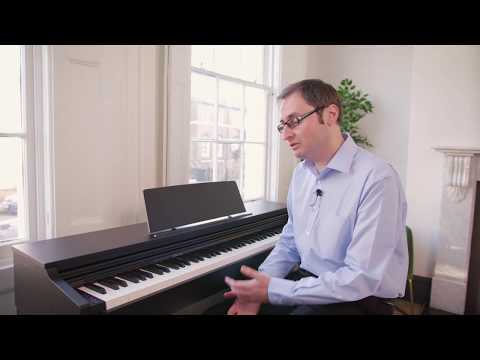 Duet Mode splits the piano into two equal pitch ranges, allowing a student and teacher to work with the same range of notes. The AP-270 has a built-in 60 song library and two-track sequencer functionality but it is also capable of connecting to your computer or smart device via the built-in USB connection. This makes it ideal for song-writing with the audio software of your choice. The AP-270 has the ability to work alongside the free Android and iOS app Chordana. Chordana Play connects to the AP-270 and teaches you to play in a fun and visual way. Follow the music score or piano roll notation at your own pace, with the app guiding you through each step. Elegant yet modest, the Casio Celviano AP-270 Digital Piano in a luxurious black finish is ideal for anyone that has a passion for the piano.